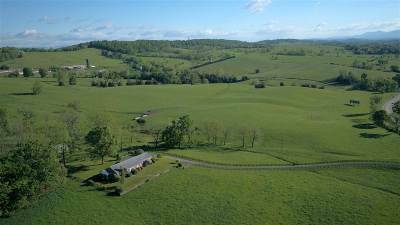 Beautiful farm with rolling pastures, exceptional views, powerful spring and convenient location. 2183 SQFT 3 bed, 2 bth Home with full unfinished basement. Hardwood floors throughout, 2 wood burning fireplaces, one in the living room and another in the unfinished basement. Great screened porch for enjoying those quiet summer evenings, an enclosed brick "breezeway" connects the 2 car garage to the main house, and makes for a perfect mud room. Concrete block barn/workshop also offers lots of possibilities. The home is serviced by spring water, and the property is about 25 acres woods, withthe remaining 125 in good pasture. The zoning (SFGA) reflects the "single family" development potential of the property, and would make a great investment.